Discussion in '3rd Gen Tundras (2014+)' started by cfred70, Dec 6, 2017. Mannishboy and Mikekoot like this. Do you just have to drive in a straight line all the time?! I can turn lock to lock just fine no rub at all really only in reverse at half lock and that’s only because I haven’t fully finished my BMC. 2015 DC 4x4 Limited, Blue Ribbon Metallic. 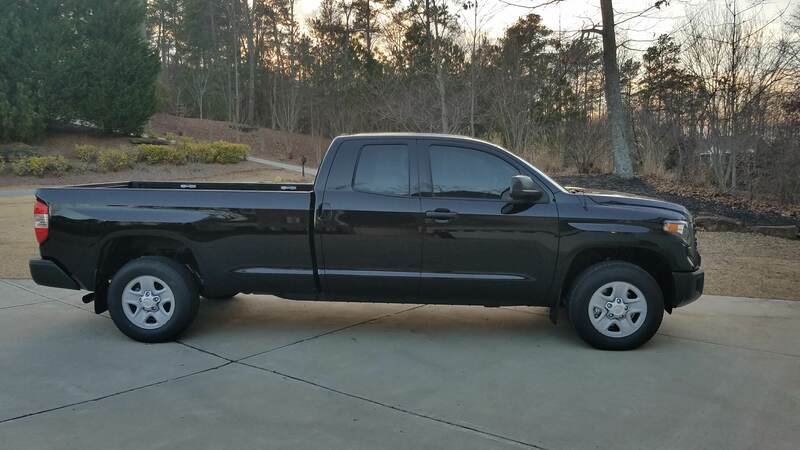 TRD exhaust, TRD cai, TRD rear sway bar, TRD shift knob, Sequoia front sway bar, bed extender, bed step, Weathertech floor mats and window vents, spray in bed liner, Morimoto fogs, Access tonneau bed cover. Pops, what brand steps are those? I like them. Here is mine after 5100's on the middle setting. What offset are your wheels? What affect on mpgs after the leveling? OR18TRD and Rica25 like this. I wish there were more options in that size. I like my wheels. I like my tires. I rarely go off-road, and never rock climb (that’s what my Jeep is for). I usually decide very quickly how I’m going to mod my truck, but I can’t decide whether to level, lift, or leave it...plus the rake isn’t as noticeable as some trucks I’ve seen. Another factor is that I’ll be towing the boat often and that should drop the back to make it more level anyway, right? I’ve had the truck almost a month, and I just can’t decide. TUNDRA375 and OR18TRD like this. Looks good as is if you don’t need the height I’d leave it. Didn't need to see this thread, now I want to level mine. Looks good. I can't be happier with the ride performance of the 6112s at 1.3" up front. IMO if you are spending the money (or time) to get have your front end ripped apart, and spending $100 to have it realigned, you might as well spend what amounts to a month of gas to upgrade the suspension more than just spacers. These are with BFG KO2 275/70R18s. It's a hair raked. Just looks and drives beautifully. No lift in the back. No regrets. A bit poorer, but a lot happier. If you are mechanically inclined, heres my DIY. Level lifted SR Looooooooooooooooooooooooooooooooooooong bed. TUNDRA375, KELZ84, SiberianTundra and 7 others like this. That looks like a completely different truck!!!! You turned a Pig into a Prom Queen. I’m so jealous of the long beds. Would be awesome to load up two dirt bikes straight and close the tailgate. Rough Country 3/1 with 20 x 9 and 275 55 20s. Will be going to a 285 60 20 when these wear down. TOYOTRD8 and KELZ84 like this. Haha. I can always see the potential in the fat girls. Or just about any load. Loving the length. Hate the parking. How does having an unraked/leveled truck affect hauling in the bed or towing? Seems like it would have an adverse affect on what the vehicle was primarily built to do. Do suvs get leveled? I hadn’t really heard of this when I had my 4Runner leveling seems all the rage on the tundra forum. I tow my boat all the time and have noticed 0 difference in its pulling capability. Also yes, you must be very new to all of this. People level all types of different brands of SUV’s and trucks. Tahoe’s, F150’s, 4runners, you name it. What’s the basically biggest tire size? I'm pretty sure they are 285/70r18 with +18 offset. I would walk outside and check, but I'm 6,000 miles away from my truck currently. However I did a LOT or research before pulling the trigger, and it paid off! Overall the truck size went from "meh" to "woah thats a beast"
Bilstein 6112 set @ 1.9” in the front and no lift in the rear. I have some rub in the front most driver side inner fender and can’t find a way to stop it from rubbing. Prefer not to add any additional lift. Boo. Nice not a fan of the long bed but that’s sweet. Where did you purchase the OZ wheels from and what was final cost with sensors? Before and after. 5100’s on middle setting. Rob's Inferno, Jim LE 1301 and r1-superstar like this. 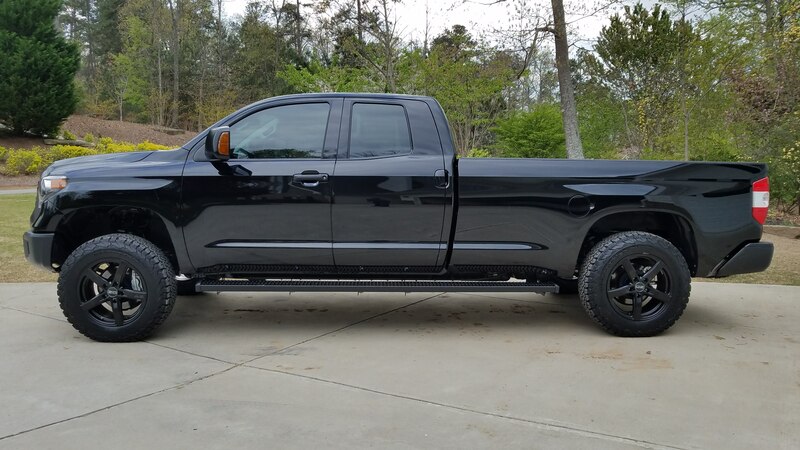 Dmas, 2016Tundra_SR5, TOYOTRD8 and 2 others like this. 3/1? What tires size are you running?